The best Rice Cooker can be hard to find. There are so many models with so many different features. I suggest you find the most important feature you need and buy that one. Many rice cookers are not expensive but they save you from soggy or under-cooked rice. Want perfect rice every time? You must get a rice cooker as soon as possible. Want to skip ahead? Please click on a link below…otherwise, continue to read on. Whether you’re looking for the best rice cooker for home or the best rice cooker for college, there is one for you. Here are the most popular choices for top-rated rice cookers in each category. I think you’ll be happy with whichever choice you make. Everyone has at least one feature they absolutely want in a rice cooker. You might want a delay start timer. Others want the bowl to be fully stainless steel and free of Teflon. It may be essential that you have a steamer included for cooking chicken or vegetables at the same time as the rice. The idea of a steamer would suit anyone who wants to cook an entire meal in their rice cooker, saving time and clean-up. These are the features which determine how to choose a rice cooker. Price is usually not a big factor. Plenty of rice cookers are under $50 (see the link above). So price is usually not the way to make your choice. 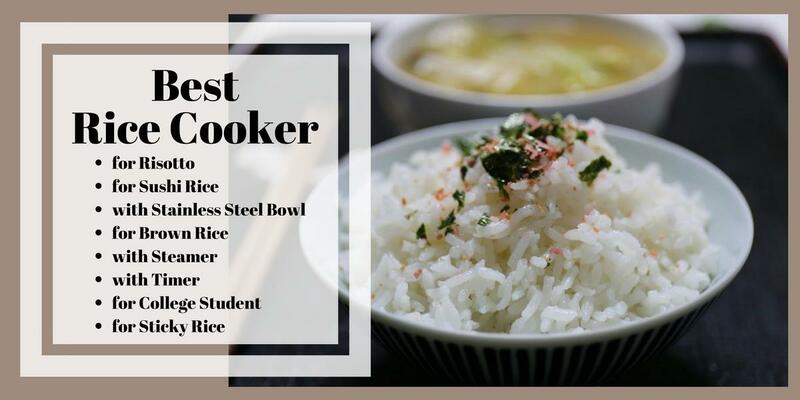 However, if you are on a strict budget, see the rice cooker for college students below. Decide on your main feature and then choose a rice cooker with a few extra features that are desirable to you too. Some of the main features are highlighted below. Take a look at the reviews and see what suits your style of cooking. The reason this is the best rice cooker for risotto, is the Sear then Simmer setting. It is hard to find a rice cooker with this type of setting. I like to sear the onion, garlic and mushrooms for my risotto first in the rice cooker. The setting automatically switches to simmer once the liquid is added to the bowl. I add some of the liquid to stir through the rice in the rice cooker until the grains are almost translucent. Then I let the whole risotto simmer in the rice cooker and it produces a delicious result. Everything is done in the one pot in the rice cooker. It’s so easy to clean up afterwards. I think you’ll be very happy with the risottos you can make in this rice cooker. There really is minimal effort for maximum results. It’s a large rice cooker of 10 cup uncooked rice capacity (this is the special rice cup size measuring cup which is smaller than normal cups). It produces 20 cups of cooked rice. Even though it’s a large rice cooker, you can cook as little as 2 cups of rice in it. Apart from the Sear then Simmer setting, the Aroma ARC-1010SB also provides settings for white rice and brown rice. There’s also a steam setting. Can I use this rice cooker to steam food? Not only is this the best rice cooker for risotto but it’s also a steamer. It comes with a steam pan to place in the top of the bowl. You can steam vegetables or protein like chicken, fish or meat in the top steamer. You can even steam in the top while the rice is cooking in the bowl below. I love being able to cook an entire meal in this rice cooker. This is a very versatile rice cooker. It also has the convenience of a 15 hour delay timer. You can set it in the morning before you go to work so dinner is ready later. If you’re looking for the best rice cooker for risotto, you really can’t go past this Aroma rice cooker for best results, convenience and great value. This rice cooker includes a rice measuring cup and a rice paddle for serving the rice. The bowl is non-stick and can be placed in the dishwasher. The Aroma ARC-1010SB automatically switches to warming mode after it finishes cooking. This is a good value rice cooker with lots of functionality. You can feed the whole family and set the timer in advance to have your food ready when you need it. This is the best rice cooker for sushi rice. It has a specific setting for Sushi Rice on the display panel. This makes it really easy to get great results. Because sushi rice needs to be handled after cooking, it is best when it’s slightly firmer. This rice cooker uses smart technology to give you perfect sushi rice. The Zojirushi NS-LAC05XT is a micom rice cooker. It uses fuzzy logic with a microcomputer chip to cook your rice perfectly. There is a specific setting for sushi rice which makes it really easy to get great results. I’ve found you really can’t get the same results for sushi rice with a cheaper rice cooker. You need a micom rice cooker. With a cheaper rice cooker it can’t sense when to turn to warming mode in any different way from cooking normal rice. The micom feature means the rice cooker adapts to what is required during the cooking cycle. It’s maximum capacity is 3 cups of uncooked rice. Like all rice cookers the measuring cup is provided and is smaller than a normal cup size. You must use this special rice cup to get accurate results. The cooked rice capacity ends up being around 6 cups. If you want to take your sushi rice to the next level, this Zojirushi NS-LAC05XT rice cooker is a good buy. Can this rice cooker make porridge? There are other advantages to owning this rice cooker. Apart from the sushi setting, it also has settings for white rice, brown rice, mixed rice, porridge, and quick cooking. If you’re looking for the best rice cooker for sushi, this rice cooker offers a lot more than just good sushi rice. It has a 24 hour delay timer. You set the number of hours for when you want the rice to be finished cooking. The longest time you can set is 23 hours 59 minutes. This timer is fantastic for waking up to perfectly cooked steel cut oats. You can also put the rice in before work, set the timer and come home to rice ready for dinner. There is a detachable inner lid for easy cleaning. It comes with a rice measuring cup and a rice spatula. The inner bowl has a non-stick surface for easy cleaning. 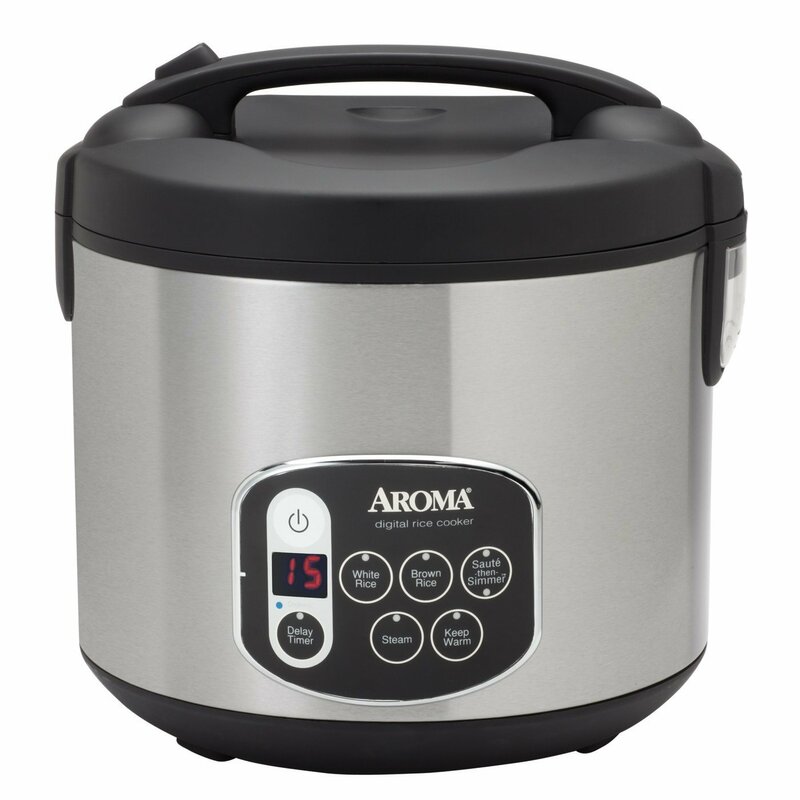 The best rice cooker with stainless steel bowl inside for cooking is the Aroma ARC-753SG. Don’t be fooled by rice cookers including stainless steel in their description. The majority of them only have a stainless steel exterior. If you are truly looking for a stainless steel inner pot without any coating then this is the best rice cooker for you. This model offers a 3 cup uncooked rice capacity. But if you need bigger, it also comes in 7 cup and 10 cup versions. Click here for the 7 cup and Here for the 10 cup. A lot of people are trying to avoid non-stick surfaces these days for health reasons. If you want a stainless steel rice cooker for this purpose, the Aroma ARC-753SG is ideal. The cooking pot is made from 100% surgical-grade 304 Stainless Steel. The inner pot is removable for easy cleaning. And the rice cooker comes with a rice measuring cup and serving spatula. This rice cooker is very simple to operate. It only has one switch and it automatically goes to warming mode once the rice is cooked. In this Aroma 3 cup rice cooker you can use as little as 1 cup of rice. This makes it ideal for singles or couples. Obviously, if you need to feed a large family, please consider the 10 cup model which makes 20 cups of cooked rice. This rice cooker can also be used to make soups, chili or stews for dinner. And if you want an easy breakfast, it can make porridge. For the price of a steamer, you get a quick method of making a whole meal in the rice cooker. It’s healthy cooking, made easy. The good news is that this Aroma rice cooker can be used as a steamer. The bad news is it doesn’t come with a steam tray. But…back to the good news…you can buy a stainless steel steam tray to go with this rice cooker. I love using the steam tray. It is really handy for steaming vegetables or protein such as fish, chicken or meat. The steamer tray is made out of stainless steel but the handles are plastic to keep them cooler. The Aroma Housewares RS-03 Simply Stainless Steamer is so convenient. And it is dishwasher safe. It lets you cook a healthy meal with very little effort and minimal clean up afterwards. When you buy the Aroma ARC-753SG Simply Stainless Rice Cooker, I highly recommend you buy the steamer tray at the same time. You know you’ll put it to good use. If you want healthy meals, this is the way to get them. This is the best rice cooker for brown rice if you use the Whole Grain setting. 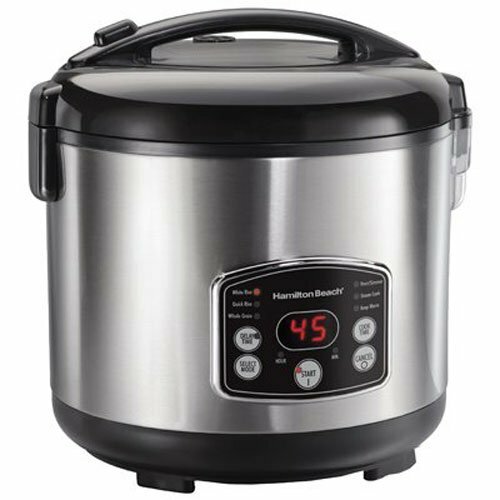 This Hamilton Beach 37549 rice cooker has several settings but the Whole Grain setting gives you perfect brown rice, quinoa, barley and other whole grains. There are also settings for white rice, quick rice, steaming, heat/simmer and, of course, there is a keep warm setting. The heat/simmer setting is best for cooking beans, making soups and one pot meals. You can also use it to make flavored pasta and rice mixes. And you can make Mac and Cheese in this rice cooker. There are a lot of choices with this rice cooker. The steam cook function lets you cook vegetables and fish or meat in the top of the rice cooker. This is one of the best rated rice cookers and it does a lot more than just cook rice. It’s a 7 cup rice cooker resulting in about 14 cups of cooked rice. It comes with a specific cup for measuring the rice. There’s also a rice paddle included for serving. 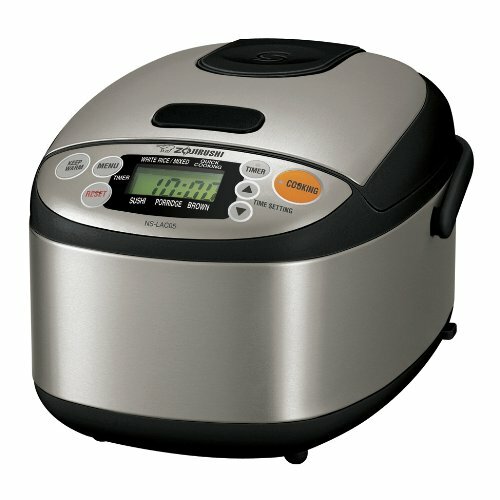 This Hamilton Beach rice cooker has a large capacity but you can use as little as 1 cup of rice if you don’t need much. The cooking bowl has a non-stick coating and can be placed in the dishwasher for easy cleaning. There is a 15 hour delay start timer so you can organize your rice in advance. But you should know the timer only works for the white rice settings, not whole grain. The Zojirushi NS-WAC10-WD is more expensive but it will give you a delay timer for the brown rice setting. So, if you really need the timer setting for brown rice you might need to choose a more expensive rice cooker like the Zojirushi NS-WAC10-WD 5.5-Cup Micom Rice Cooker (it also comes in a 10 cup option). This more expensive rice cooker uses fuzzy logic to cook brown rice perfectly. But back to the Hamilton Beach model…the Hamilton Beach 37549 rice cooker is one of the best rice cookers and very popular with families and individuals. It makes the best brown rice effortlessly and you get bang for your buck. This rice cooker offers a lot of convenience. It’s very affordable. And if you need a larger rice cooker, there is a 10 cup model that makes around 20 cups of cooked rice. Click Here to see the 10 cup Hamilton Beach rice cooker. 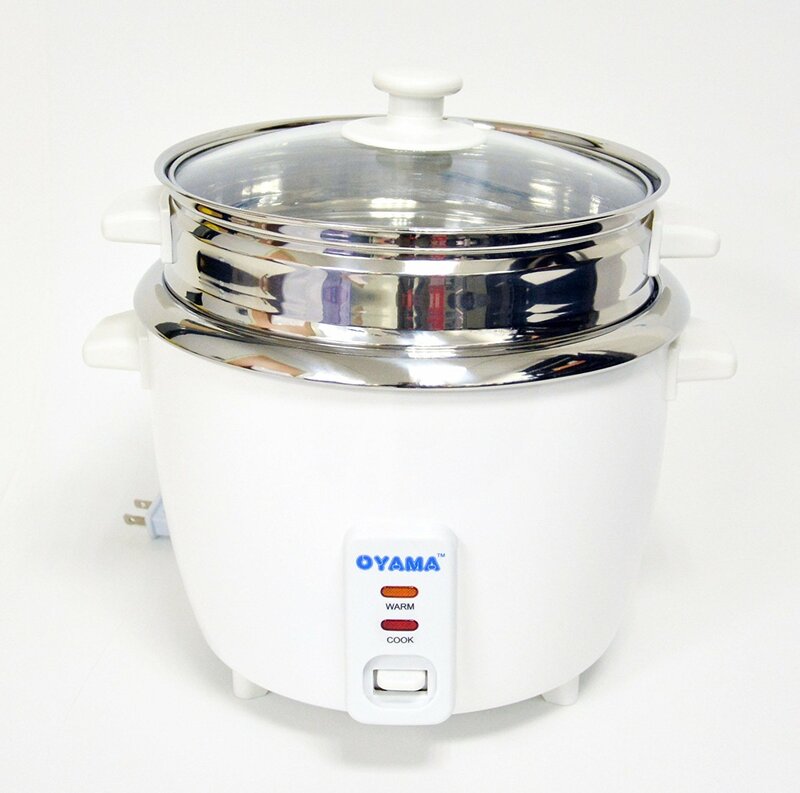 If you’re looking for the best rice cooker with steamer, the Oyama CNS-A15U is a great choice. The steaming tray is stainless steel and the rice bowl is stainless steel. The advantage of 304 grade stainless steel is that you can use the steamer for lots of different foods without the flavor being retained in the tray. Some people notice that if they steam fish in a plastic steaming tray, it then flavors vegetables the next time they go to use the rice cooker. This is a good value rice cooker. It holds 8 cups of uncooked rice. It is a large rice cooker which means the steaming tray is slightly bigger in diameter than some other models. This gives you more choice in the foods that fit in the tray. By being bigger you can also fit enough vegetables along with protein like chicken to cook a whole meal. The lid is glass so you can see your food as it cooks. This Oyama is one of the best rated rice cookers and very popular because it’s simple to use and easy to clean. It also produces great rice. Now, if you’re in the market for a micom rice cooker with steamer, you’ll like the Tiger JBV-A10U-W rice cooker. There is a function called tacook which is unique to the Tiger brand. It has a special steaming tray. What’s special about this rice cooker? The steamer tray in this rice cooker is designed so the food in the tray does not flavor the rice below it in the pot. Nor does it change the texture of the rice by dripping onto it. The tray is BPA-free plastic and high quality. Because it doesn’t affect the rice below, you can do more with this rice cooker. This is the best rice cooker with steamer because it saves you time and effort by cooking all the food in the same pot without sharing flavor. You can cook chicken and vegetables in a tomato sauce in the top tacook steamer tray and use the rice in the bottom for something completely different like a sweet dessert. Because the rice hasn’t been affected by the food above, it can be used in more ways. What other settings does it have? This Tiger rice cooker has four settings, plain rice, brown rice, synchro cooking and slow cook/steam. The synchro cooking setting is used for steaming in the top tray while cooking in the pot at the same time. It is a smart rice cooker. By using the slow cook setting, you can even cook a pot roast in your rice cooker. Even though you pay more for this rice cooker it is an impressive appliance and very versatile. If your lifestyle means the steamer tray can save you time and effort, it’s probably worth spending the extra money on this rice cooker. And because it is micom (an onboard microcomputer chip) you get restaurant quality rice. It’s noticeably different and a perfect texture. This is a 5.5 cup uncooked rice capacity. But if you want a much larger version there is a 10 cup uncooked rice model which yields 20 cups of cooked rice. Great for a large family. Grab the Tiger JBV-A10U-W rice cooker with steamer today and you’ll be glad you did. It gives you the convenience of tacook. If you’re interested in seeing food cooking using tacook, here’s a video. This is the best rice cooker with timer. The delay timer works for cooking rice. It also works for the slow cooking function on this rice cooker. It is quite difficult to get a rice cooker with a delay start time on a slow cooking function so this is definitely an advantage. There is one disadvantage that I know of on this model. The delay start timer can only be set in hours. I have never had a problem with this. But if this causes you concern you should consider the Zojirushi NL-AAC10 micom rice cooker. This rice cooker lets you set the delay timer in hours and minutes anywhere between 1 1/3 hours and 13 hours. The delay start time can be used for the white rice, brown rice and sweet rice settings. It cannot be used for the mixed rice setting or steaming. This is quite common on most rice cookers that the timer can only be used on rice settings. This Zojirushi rice cooker comes with a steaming tray and steam setting. You can steam vegetables and protein on the top while cooking rice in the bowl. It also has a detachable inner lid. This makes it easy to rinse clean. This rice cooker has a porridge setting to make a perfect breakfast. Put your oats in the night before, set the timer and wake up to breakfast ready-to-go. There are two ways to approach this. You can get the cheapest decent rice cooker with a steamer tray for your college student. But, if you want more opportunity to cook a variety of healthy meals then I’d recommend you increase your budget and get a rice cooker with more settings and a timer. If you want to take the basic approach, it will be perfectly adequate. 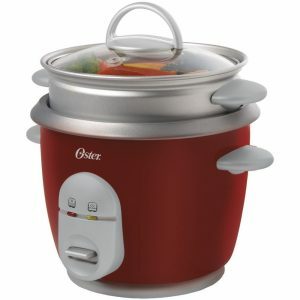 The Oster 004722-000-000 Rice Cooker is a great choice. It holds 3 cups of uncooked rice. This makes it perfect for a single person, plus there will be left overs for lunch the next day. It comes with a steamer tray, rice measuring cup and rice spatula. With the steamer tray you can make lots of different meals all in the one pot. Steam vegetables, chicken or fish in the steamer while cooking rice in the pot. This rice cooker lets you cook healthy meals very easily without a lot of kitchen equipment. It is simple to operate with only one switch to turn it to cooking mode. Once you plug it in, it automatically goes to the warming mode before you press the switch to cook. This rice cooker will give you great rice and you can cook other meals in it too. Try casseroles, stews, soups, porridge and paella. The bowl is non-stick and easy to clean. This truly is a good rice cooker – simple, yet effective. Are you looking for a portable induction cooktop for a dorm room? For details click here. Now if you want to take the second approach, that is, more settings and a timer, take a look at this rice cooker for a college student. 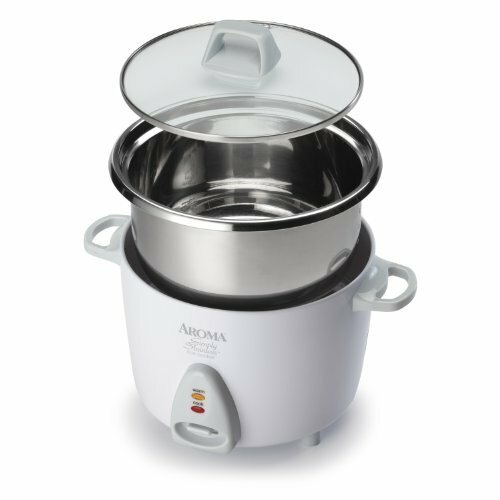 The Aroma Housewares ARC-914SBD offers separate settings for white rice, brown rice and steaming. It also has a 15 hour delay timer. This means a college student can put on a timer with the rice in the pot and come back to their dorm room with rice cooked and ready to go for dinner. The rice cooker automatically switches to keep warm mode after it finishes cooking. There’s no pressure on you if you’re running late. This rice cooker is ideal for a college student with a 4 cup uncooked rice capacity. If you only want to cook one cup of rice you can. The rice measuring cups for all rice cookers are smaller than a normal cup size. They are about three-quarters the size of the normal size. So 1 rice cup is smaller than 1 measuring cup. A college student can make enough food in this rice cooker to have left-overs for the next couple days. Healthy meals are easy with the steaming function. This rice cooker really is perfect for any college student if they want to eat healthy and save money on meals. The Tiger JAY-A55U-CU rice cooker is the best rice cooker for sticky rice. The way to do it is to buy Sushi Rice and rinse the rice thoroughly until the water is clear. Next put the rice in the bowl of the Tiger JAY-A55U-CU rice cooker and fill with water to the correct line measurement. For example, if you’re using 2 cups of rice, place the rice in the bowl and then fill to the number 2 on the markings inside the bowl. Let the rice sit in the bowl with the water and soak for 4 hours. After this time, choose the plain rice setting and let the rice cook. It will probably only take around 20 minutes. The cooking time is much shorter than the soaking time. Now serve, and enjoy your sticky rice. This Tiger rice cooker produces restaurant quality rice. It has lots of settings for white rice, brown rice, mixed rice, quick rice, porridge and a GABA rice setting. It is a high quality rice cooker. When you’re looking for the best rice cooker, all of the above rice cookers will do a great job with the settings provided. However, if you’ve owned a rice cooker for many years and you eat rice several days a week, you might want to consider buying an induction rice cooker. Induction rice cookers are a lot more expensive. They do make restaurant quality rice and many rice-eaters around the world wouldn’t live without one in their kitchen. However, an induction rice cooker is not for someone who only eats rice a couple times in a month. An induction rice cooker is the best rice cooker for someone who eats rice daily or at least several times a week. If you’re interested in seeing more details about induction rice cookers click here. I firmly believe it’s best to get yourself a reliable traditional rice cooker (like the ones reviewed above, click here to go to reviews) first and foremost, rather than waiting and saving to buy an induction rice cooker. A rice cooker is a very affordable kitchen appliance and it gives you consistent results every time. You get perfect rice that I’ve never been able to achieve in a pot on a stove top. Once you’ve owned a rice cooker for about one week, you’ll wonder why you waited so long to get one. If you know someone who’s moving into their own place for the first time, give them a rice cooker. If you know someone who’s been using the same rice cooker for the last 20 years, buy them a new rice cooker with new features. You can find the best rice cooker for each and every home cook. Enjoy your perfect fluffy rice today. ⇒ Have you tried making ice cream at home? See the best ice cream makers here. ⇒ Do you need a portable induction burner to use as a warming plate at home? Excited to know about several Rice cookers with different features/functions. Will definately look for one that best suits me locally or order for one online. Thanks for sharing.